On New Year’s Day, The Rose Parade will take to the streets of Pasadena to celebrate what brings us together. This weekend, guests gather together to celebrate the finer things in life at The Inaugural Pasadena Tournament of Roses® SIP & SAVOR Premiere! We had the pleasure of being invited to the first night of the event and we had an absolutely spectacular time! Something we loved about this event, in particular, was the opportunity to see the floats up close! We have always seen the Rose Parade floats on television but it is certainly something special to see them being worked on! The process was interesting to watch, as we didn’t realize all the work that goes in behind these grand and glorious floral masterpieces. Getting the opportunity to see the floats just made us more excited to see these floats on TV when we watch The Rose Parade on New Year’s Day! There were so many tasty beverages to choose from at the event! With plenty of breweries and wineries located in California, there are plenty of locations to call upon for Sip & Savor! We were never disappointed with any of our drink choices, whether it be wine or a mixed drink sample. There was definitely something for everyone over the age of 21 to sip and enjoy! It is no secret that we love food here at DAPS MAGIC. One of our favorite things to do at tonight’s event was to stroll around and eat at some of Los Angeles’s favorite eateries! No matter what type of food you were craving, there was something to snack on! From Italian to Asian to Mexican food, you can find new favorites all in the same place! Our standout meal was definitely Crack Shack, a chicken restaurant with locations in Las Vegas and Southern California. The winner of the entire Pasadena Tournament of Roses® SIP & SAVOR Premiere was the entertainment offerings! With many names we recognized, like Hard Day’s Night and Suburban Legends, we were excited to catch the main stage! These offerings definitely did not disappoint, bringing energy and life to the center of the Sip & Savor event! Check out some of our favorite sets below! With such a full night, we hope this event makes a return in the upcoming years so we can see how it grows and taste even more! 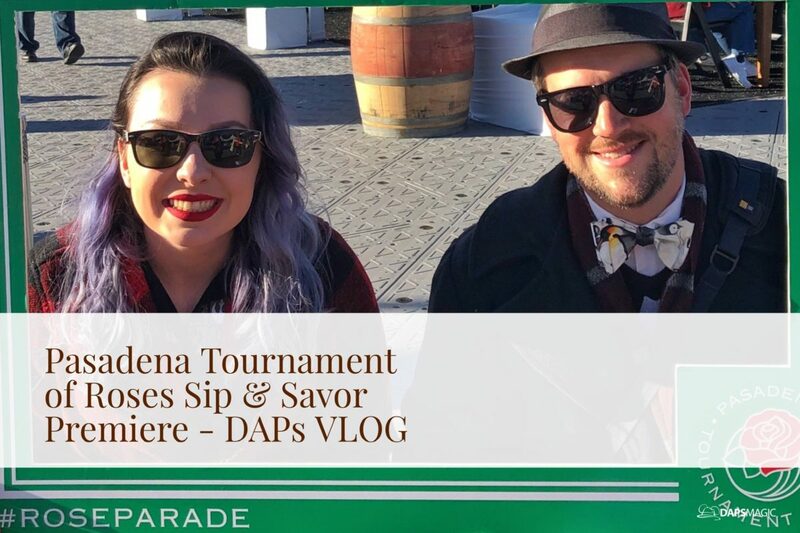 Check out our full vlog below to see all the fun we had at The Inaugural Pasadena Tournament of Roses® SIP & SAVOR Premiere! Be sure to catch this event before it ends on December 30. General Admission for all ages 5+ is $15.00 (plus ticketing fees). What would you like to try most? Let us know!